Food trends can make or break an ingredient’s reputation. All it takes is the publication of a silly carb-less diet or the disclosed eating habits (or lack thereof) of a swanky A-lister and your favorite ingredient could go MIA – either blacklisted at most restaurants or too taboo to enjoy even in your own home. On Monday, Mark Bittman introduced a contest on his NYTimes blog, Bitten, to make a mayonnaise using the residual fat from your bacon. Before you go into a panic attack, take a deep breath and follow me. It’ll be OK.
First off, since this is a Mediterranean blog, I decided to revisit the idea of a BLT using med-inspired flavors. No monstrous portions here, either. I chose to make pancetta, arugula & tomato crostini and used the fat from the pancetta for the mayo. Right from the beginning you’re getting double use out of your pancetta. The fat has a distinct, almost nutty, flavor that you won’t be able to achieve any other way. If you’re still having qualms about the pancetta fat, just see it as being resourceful and putting everything to good use. The mayonnaise is wonderful and nothing like what you would find in a jar – not even close for that matter. The pancetta flavor is bold and pairs well with the subtle undertone of the dijon. The egg brings everyone together and the lemon takes care of any heaviness you might’ve been worried about. It’s a well-executed team effort. The size of this dish is deliberate. It agrees with the philosophy that everything in moderation is acceptable. Granted, these crostini in no way constitute a full meal, nor are they meant to; but if you’re in the market for an afternoon snack or an antipasto to enjoy with your friends and family, you’ve got yourself a winner. Break open a bottle of wine and enjoy life. Combine egg yolk, dijon mustard, lemon juice, salt and pepper in a small food processor or a blender and pulse until well combined. While the machine is on, gradually drizzle in the fat until the mixture stiffens and you reach an emulsion. At this point you may add the fat a little more quickly. If your mayonnaise is too thick, blend in 1 tsp of boiling water to thin it out. 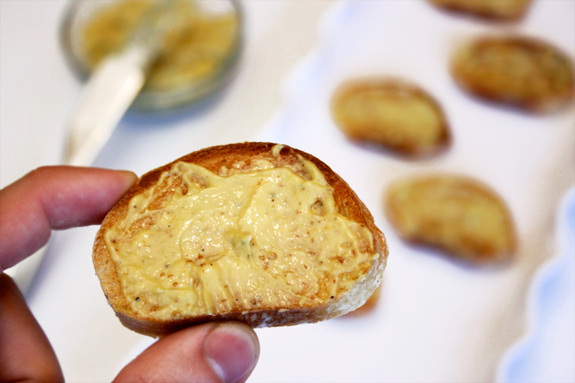 notes: To make the crostini, toast slices of baguettes or ciabatta until golden brown. 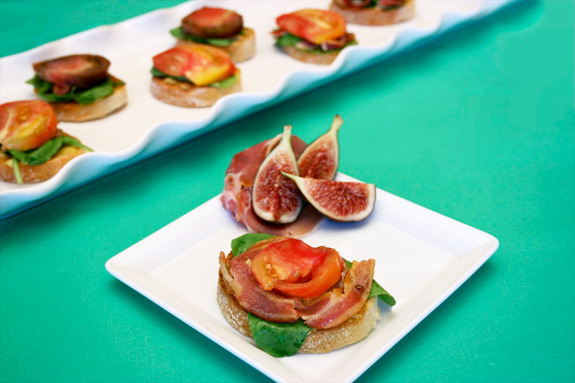 Spread a thin layer of the mayonnaise on each and top with baby arugula leaves, crisp pancetta and heirloom tomatoes. Posted in appetizers, Italian, recipe, savory by Antonio Tahhan on August 28th, 2008. You can follow any responses to this entry through the RSS 2.0 feed. You can leave a response, or trackback from your own site. Yum. I could make a meal of that, trust me. Wow, you have used fat in a very attractive and yummy looking way!! i love pancetta. i’ll love this. great idea. Everything about this is delicious, not only have I been dying to try making my own mayonnaise, but from bacon fat?! Amazing! Plus those BLTs look great. What a fun challenge! Oh, that’s lovely. I haven’t made my own mayo yet and I love the idea of a bacon fat mayo. Hey, it beats whatever they put in a jar of mayo these days. This is just gorgeous and you have a wonderful blog. That crostini looks so good. I like the sound of that pancetta mayonnaise. Thanks for putting fat into a good light, and telling us to not fear it. Moderation in everything dude, except maybe fun. In Hungary we used to cook everything with bacon fat or butter. I love the idea of your mayo and so do your blog. Pork fat mayonnaise… Tony, you’re a genius! Can I please have just one slice?? this looks so great, the colors, the food itself, and just, well, everything! That is so awesome. I haven’t done mayo before, but it just makes sense to use pork fat in this application rather than vegetable oil. Pork fat rules! OMG. I want to marry that mayo. I am so making that this week. You make the most gorgeous looking food! I also make mayonaise myself and know what a world of difference it makes in the taste. Kitt – Oh, I can believe that!! I’m glad you liked the post! HoneyB – Thanks, Shelby! Fat is a very attractive and yummy ingredient for us foodies 🙂 hopefully it’ll regain popularity soon! andreea – the pancetta was crispy and delicious! I’m so glad I stumbled upon this contest! 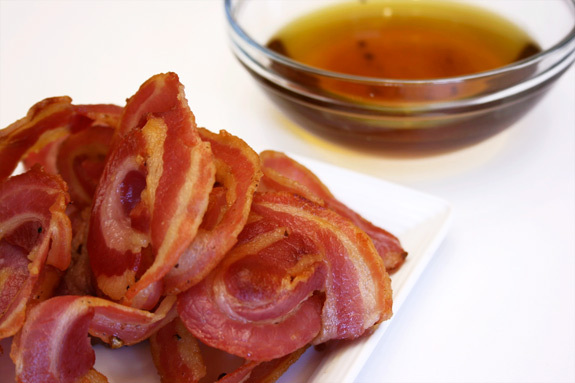 Katie – You should totally try out this recipe, especially if you love bacon (or pancetta in my case). The flavor is strong, but so good! Thanks Kevin! The pancetta was one of my favorite parts, too! Millie – Thanks! That’s why Hungarian food must taste DELICIOUS!! Tim – haha, I think the real genius is Jennifer McLagan and Mark Bittman, of course. Naama, you can have as many slices as you want! I’m glad you liked it 🙂 I wish I could ship some to you overseas! Nate – Right?! I couldn’t have said it better myself.. pork fat does, indeed, RULE! canarygirl – Nikki, you should totally make it!! Let me know how it turns out, I’m sure you’ll make it rock with your Spanish touch! Jenny – It was so, so, YUM! PG – Doesn’t it?! I find it to be less “icky” than the store bought stuff that’s almost always congealed and blah. Thanks for stopping by! I can’t wait to check out your blog, too! I really dig your blog. This is my kind of mayonnaise. 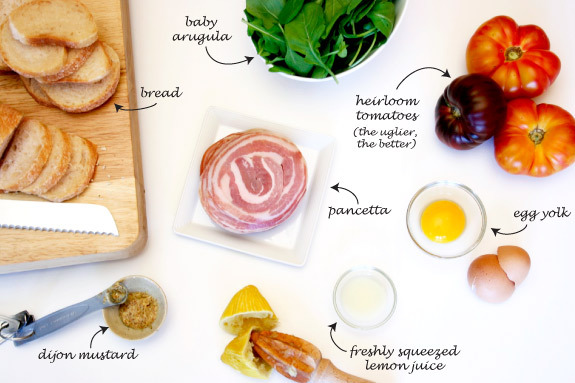 I have recently fallen in love with Pancetta… I will definitely be trying this.